Stocks makes it easy to follow your stocks and the market. View quotes and daily performance in a customizable watchlist and tap any ticker to see an interactive chart and key details. Stocks also includes business news from top publications around the world. • Customize your watchlist with stocks, indexes, mutual funds, ETFs, currencies, and more. • View prices and tap to switch between price change, percentage change, and market capitalization. • Track stock performance throughout the day with color-coded sparklines. • Tap any ticker in your watchlist to see price charts for day, week, month, and multi-month periods. • Touch the chart with one finger to see the price at a specific date or time, or touch with two fingers to view price change over time. • View key details including after-hours price, trading volume, and more. • Browse headlines and read beautifully formatted stories right in the app. 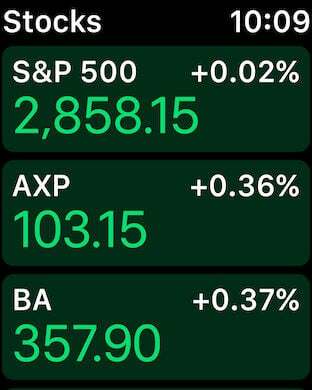 • Use the Stocks app on iPhone, iPad, and Mac. 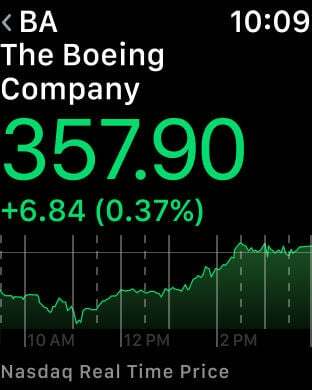 • Sign in to iCloud to view your watchlist, market data, and business news in Stocks on all your devices. • See your watchlist in the Stocks widget on iOS or macOS. * Top Stories and Apple News stories are available in the US, UK, and Australia. News stories in other countries are provided by Yahoo.